The light created at dawn is ideal for nature photography because of its soft quality and subtle directionality. This type of light seems to wrap around subjects, producing a three-dimensional look with a level of contrast that’s easy to work with (meaning images have detail in the shadow and highlight areas when exposed properly). You can take advantage of this beautiful, soft light, but remember that there’s not much of it. You need lengthy exposures (so bring a tripod), and the lighting changes very quickly at this time of day because it’s a transitional period. If you want to use the dawn lighting, work quickly enough to capture some shots before the sun breaches the horizon. 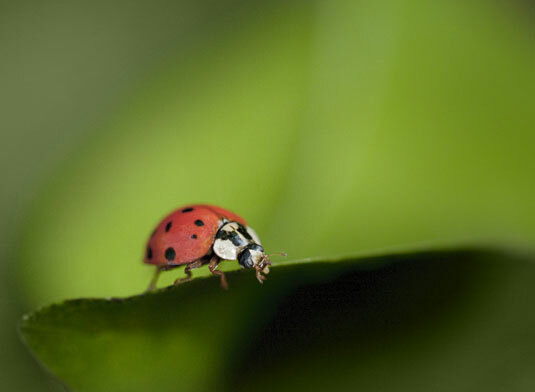 This ladybug was photographed at dawn. When the sun comes up you’re greeted by a whole different kind of light that works great for photography. Sunrise light is ideal for revealing texture in scenes and subjects because it comes from low in the sky and so provides great opportunities for side lighting. Take advantage of the sunrise by including the long shadows it casts, by creating dramatic images with high contrast between light and shadow areas. The pristine quality of sunrise light typically lasts about fifteen minutes to a half hour depending on the time of year and your location. After it passes, you’re left with a sunlight that’s similar to the light at sunrise in direction and brightness but with less warmth in its color. This type of light is great for photographing just about anything, but it lacks the freshness of sunrise and is less ideal for side lighting. The best thing about this light is that it sticks around for at least an hour or two. Of course it changes slightly as the sun rises in the sky, but the look of your images will remain consistent within this time period. When the sun gets very high in the sky it lights everything from above, casting undesirable shadows. When you notice that the sun is too high to produce nice direction of light and shadows in your images, you will have to find ways of enhancing and manipulating natural light. You can achieve a very similar photographic experience by going out at the end of the day rather than the beginning. Keep in mind that the order of events is reversed in this case, and you most likely won’t have any dewdrops in your scenes — but you could carry a small spray bottle with you to create your own dew whenever and wherever you want it.